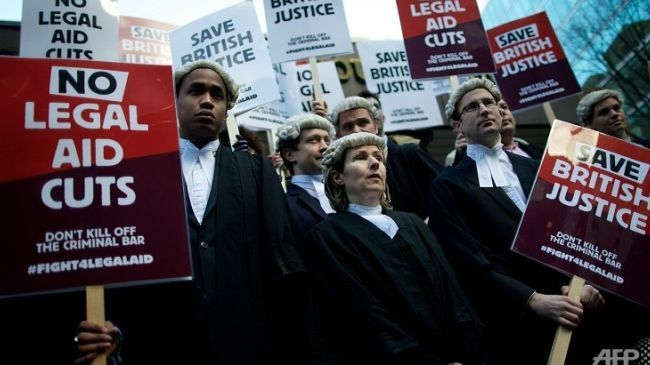 Hundreds of British barristers, lawyers and law students are set to attend a protest gathering in London to express their opposition to proposed legal aid cuts. The protest gathering entitled ‘One Bar: One Voice – United for Justice’ has been organized by the Bar Council, which represents legal professions in England and Wales and will be held at Lincoln’s Inn in central London. Legal workers have already described the cuts as unnecessary, arguing that the slash could see their fees fall by up to 30 percent. They also fear the coalition government’s proposals to cut aid will affect vulnerable people who are in need of legal help. Cutting the legal aid scheme has been described by Britain’s Ministry of Justice (MoJ) as very important. The MoJ claims the aid will remain “very generous” even after the proposed changes are enforced. However, legal workers believe the coalition government’s attack on legal aid will seriously undermine access to justice and the rule of law. “This is a vital opportunity to demonstrate that the whole profession stands together in support of the rule of law and access to justice, which are under grave threat from the government’s proposed cuts,” said Nicholas Lavender QC, chairman of the Bar. The Bar’s chairman pointed out that “the public interest and the society which we seek to serve” would be the greatest victims.